The Swiftwater Trailhead is the western end of the North Umpqua Trail. The Tioga Segment is the lowest in elevation, and provides year-round recreation opportunities. The trail winds through old growth forests of Douglas-fir, hemlock, and sugar pine, with trees often over six feet in diameter. The first quarter-mile of the trail is accessible to persons with disabilities and provides easy access to Deadline Falls. 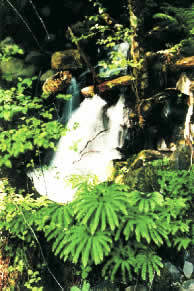 Travel another 1.5 miles through the attractive forested fern groves to the small, but picturesque, Fern Creek Falls. Day-hikers can venture a few more miles through riparian and forested areas, to Bob Butte. Then it's up the trail to a rock outcrop meadow and suggested turnaround for day-hikers. Beyond this, the trail drops down and meanders for many miles, close to the North Umpqua River. Hikers who want to complete all 15.7 miles might consider spending the night due to the long distance. There are no developed campsites, although primitive "no-trace" camping is allowed off the trail. Between the months of May and October, anadromous (sea-run) salmon and steelhead can be seen jumping the falls on their journey from the ocean to their spawning grounds. Interpretive information is available on-site. Standing on the footbridge will give you a good view of delightful Fern Creek Falls on one side and the North Umpqua Wild and Scenic River on the other.